A brand new trailer has been released for the upcoming film “Hibana: Spark” starring Masaki Suda and Kenta Kiritani. The film is based off of the novel “Hibana” written by Naoki Matayoshi. Published in March 2015, it was an instant success winning the famed “153rd Akutagawa Award”. 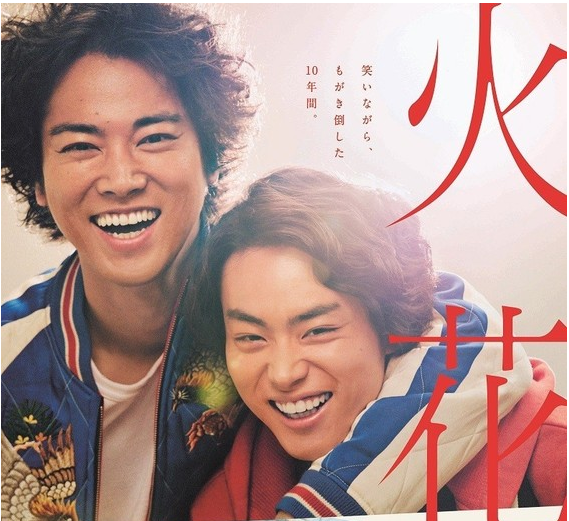 Last year the film was adapted into a Netflix drama series which starred Kento Hayashi and Kazuki Namioka. Masaki Suda plays the role of “Tokunaga”, a rookie comedian who is very unpopular. While attempting to increase his popularity Tokunaga crosses paths with “Kamiya” (Kenta Kiritani) who is a senior comedian. Kamiya’s style of comedy is quite racy, not afraid to liberally use foul language. However, he undeniably has very strong comedic timing and has crafted his humor well. Tokunaga is drawn to this and asks Kamiya to become his mentor. Kamiya accepts the offer, and regularly coaches Tokunaga while the two drink. Slowly but surly Tokunaga starts to gain popularity as a duo with his partner Obayashi (Masaki Miura). While Tokunaga begins to raise, Kamiya falters and has to come to terms with many of his own personal issues. He falls into dept and then suddenly disappears. “Hibana: Spark” will hit Japanese theaters nationwide on November 23rd. Watch the trailer below!